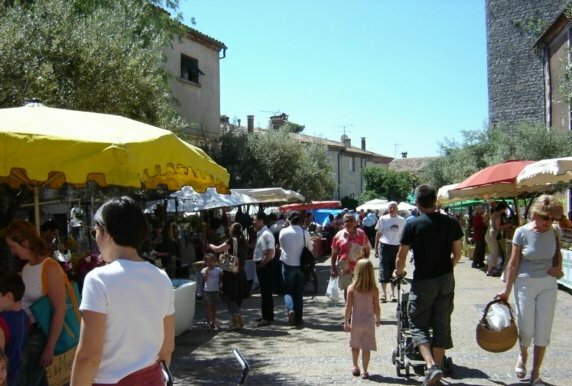 Viols le Fort is a village practically next door to the hamlet of Viols en Laval. VeL has the chateau and prehistoric park, a post office, restaurant and few houses. VlF is one of those seemingly sleepy villages you see with shutters drawn and not a soul in sight during the summer months. However, it is a hotbed of artistic activity, and, like VeL next door, has become something of a community of craftsmen and artists. Today it was en fête and the main street was alive with stalls, musicians, and a pen of poo-depositing goats. It's a shame my youngest was not there, he would have felt quite at home! 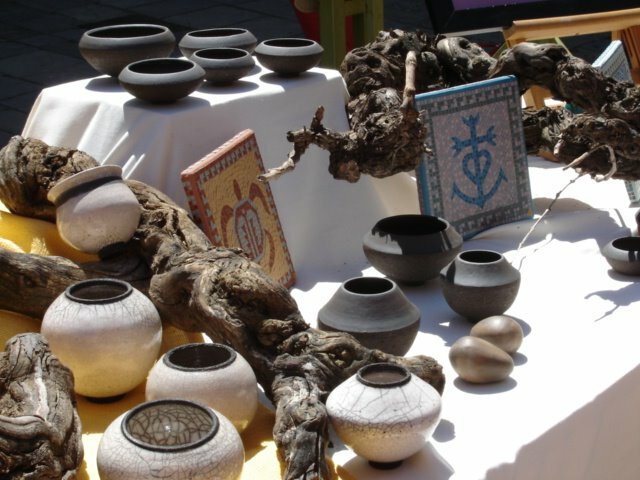 My friend Anne was displaying her pottery and mosaic, minus a certain table (which looks lovely in my sitting room). When J and I arrived, her husband had just finished losing a game of chess to a young man seated on some cushions in front of a chess board, there to challenge anyone to a game throughout the day. He was sat beneath a shady tree next to a van with an enticing vision of eastern peace inside visible from its open back doors. There were stalls selling more usual handicrafts - bags, pottery dishes; and others selling comestibles such as goats' cheese, organic bread which looked like you needed a pneumatic drill to crack the crust, olive oil and wine. 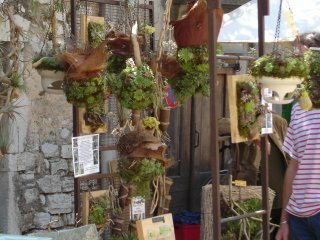 The stall which attracted my attention was not the one displaying amazingly realistic faux orange poppies in a vase, or the commerce equitable stand, but one where you could feast your eyes on a glorious array of hanging baskets of air plants and succulents. They were set on artistic bits of branch, or in the case of the succulents, original matting containers which had been filled with soil and moss. Some of the plants were displayed as tableaux, others had been set into the seat of a metal chair. It was definitely a fine show of creative use of these otherwise rather banal plants. The Mairie had laid on the inevitable apero - kir, orange juice, coke with crisps and peanuts, so we sipped and enjoyed the music emanating from a group of 'Montpellier gitanes'. I'm not sure if you can be a gitane from a particular place because I thought the whole point of being a gitane was not being from a particular place, but maybe I'm behind the times, and even gitanes get settled now. The sleepy village had thus awoken, sprouted festival colours and bonhomie before sinking back into its protective shell of ancient stone walls and shuttered peace.